The New Jersey Code of Juvenile Justice is a set of rules and courts designed to adjudicate court cases for juveniles - which is anyone under the age of 18. The juvenile justice system is a complicated maze of options with a simple goal: to protect and rehabilitate juveniles accused of crimes simple and complicated. The juvenile justice system has its own set of procedures, language and rules. If you are the guardian of a juvenile who is taken into custody for a crime, the first person you should talk to is Monmouth County juvenile crime attorney Tara Breslow-Testa. Born, bred and educated in New Jersey (Rutgers), Ms. Breslow-Testa is a mother and an attorney with experience on both sides of the bench. She has navigated the labyrinth of the New Jersey Juvenile Justice system and is dedicated to maximizing the protection and rehabilitation of young people who have been accused of delinquency and taken into custody - and their families. Tara Breslow-Testa understands whether a child has been taken into custody for a charge that will be on “formal” or “informal” calendar. She is experienced at negotiating a “deferred disposition” - basically a second chance - but is also prepared for more serious matters that are transferred from family court to adult court. Tara Breslow-Testa is a juvenile crime attorney in Monmouth County who understands the complex equation of the New Jersey juvenile justice system, and she is who you want protecting the present and future of your child. 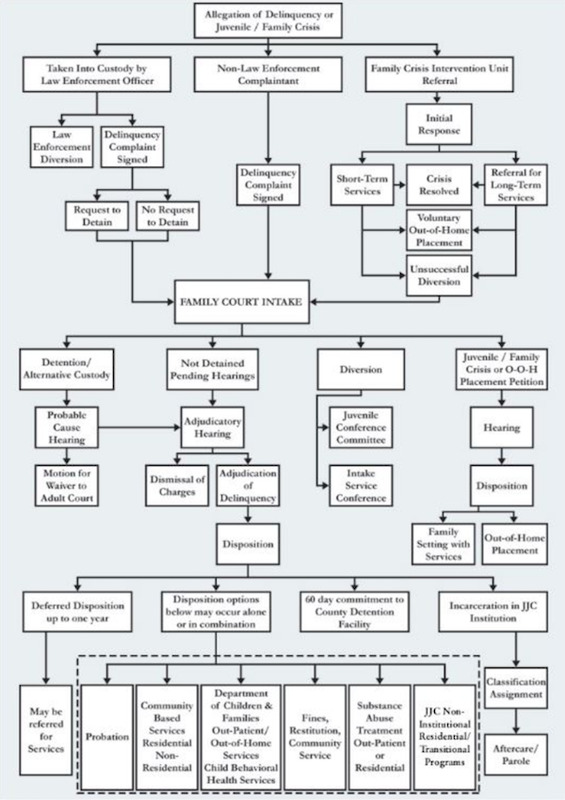 The State of New Jersey Department of Law and Public Safety Office of the Attorney General has an online flowchart to detail the wide delta of options available to juveniles accused of delinquency - and their families and guardians. The Juvenile Justice System has evolved over decades to changing times and its goal is to protect the youth of New Jersey from themselves, from their families, from the public - and vice versa. New Jersey defines “juvenile” as anyone under the age of 18, and the treatment of juvenile offenders in New Jersey has its own guidelines and definitions and courts. The New Jersey Code of Juvenile Justice became effective in December of 1983 and cover New Jersey statutes from N.J.S 2A:4A-2 to N.J.S 2A:4A-92. These statutes protect juveniles from strangers, from bad families, from themselves and also protects the public from juveniles engaging in delinquent behavior. The juvenile laws prefer supervision, rehabilitation and accountability to punishment. The New Jersey Juvenile Justice System does all it can to deflect juvenile offenders from going to court, and facing possible consequences of fines and/or time in juvenile detention centers - which are no fun. Judicial proceedings for most juveniles are handled in the Superior Court of New Jersey, Chancery Division, Family Part - although there are exceptions for motor vehicle infractions and other violations. Options for young people caught up in wrongdoing include “deferred disposition” (see below), releasing a juvenile to parent/guardian supervision, removing a juvenile from their home and placing them with a relative or other guardian, placing the juvenile in the custody of the Department of Children and Families, ordering participation in work programs, ordering participation in programs designed to enhance self-reliance and confidence. Tara Breslow-Testa is a Monmouth County juvenile crime attorney who is intimately familiar with all of these options, and she is prepared to do what is best for your child, and you. Juvenile proceedings have a kinder, gentler procedure and glossary: Juveniles are “taken into custody” rather than arrested and they are “adjudicated delinquent” rather than convicted. If a juvenile commits a crime and is taken into custody on a first offense, a judge may have sympathy for the accused, and order a “deferred disposition” - as long as certain conditions are complied with: don’t get caught drinking again, or smoking, or possessing less than 60 grams of marijuana, or trespassing. In essence, a deferred disposition is a second chance designed to let a juvenile make right on a crime, without going to court and facing the possibility of being “adjudicated delinquent” and paying fines, going to jail and having a criminal record. If you are the guardian of a juvenile who has done something illegal and this is a first offense, contact Monmouth County juvenile crime lawyer Tara Breslow-Testa. You want her in your corner when squaring off with prosecutors and judges. Matters in juvenile court are separated onto two calendars. The informal calendar is overseen by a “referee” and is for less serious infractions that do not involve incarceration if convicted: shoplifting and petty theft, fighting and possession of small amounts of marijuana. The informal court does not require representation by a lawyer, although lawyers are not disallowed either. The formal calendar is overseen by a judge and is for more serious charges that could result in incarceration - or the possible transfer of the case to adult court. A juvenile between 14 and 18 can have their case “waived” to an adult court, or that juvenile can also request their case be moved to an adult court. The crimes that can trigger this waiver are serious: kidnapping, various firearm crimes including armed robbery, carjacking, sexual assault, murder. Juveniles tried as adults have special rules. They do not have the right to have their case heard by a grand jury, and their case is heard by a judge, and not a jury. A juvenile cannot be sentenced to life imprisonment without possibility of parole, as the Supreme Court ruled that “cruel and unusual punishment,” believing that even the worst juvenile can mature into a law-abiding citizen. Juveniles are also protected from the death penalty - which is irrelevant to New Jersey, which does not have the death penalty for adults. Juveniles can also voluntarily ask that their case be moved to adult court - this could be on advice of counsel, or previous experience with an unsympathetic judge. Whether a juvenile has been accused of a first offense, or is a repeat offender, Monmouth County juvenile crime lawyer Tara Breslow-Testa has negotiated the maze of the New Jersey juvenile justice system, and knows how to avoid the dead ends, and find the best way out. The New Jersey Juvenile Justice System is complicated, but with a simple goal: Protecting young people from themselves and the public, and vice versa. If your child is “taken into custody,” the first person you should talk to is Tara Breslow-Testa. Call her at (732) 784-2880.